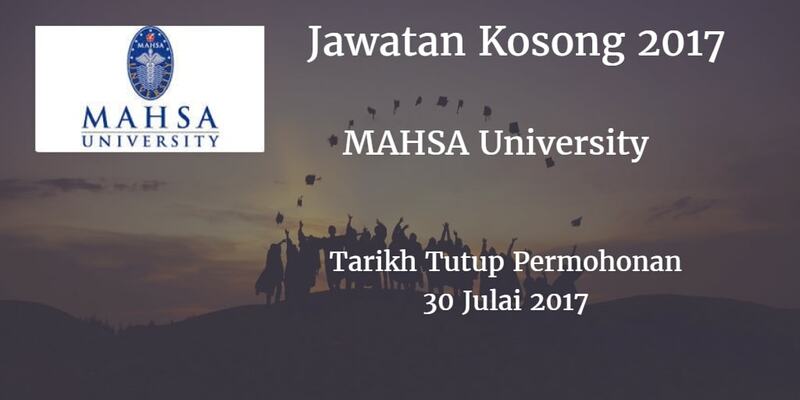 Sukacita dimaklumkan bahawa terdapat pelbagai kekosongan jawatan MAHSA University akademik dan bukan akademik berikut. Peluang kerjaya di MAHSA University. MAHSA University would like to invite qualified candidate to fill in below vacant position vacancy. Candidate must possess at least a recognized MBBS degree with Master or Fellowship in the area of specialization. At least 5 years of clinical working experience in the related field is required for this position. Preferably specialization in Healthcare - Doctor / Diagnosis or equivalent. Candidate must possess at least a recognized MBBS degree and LCP (Letter of Credential and Privileging). Preferably specialization and working experience in Aesthetics Doctor or equivalent. Candidate must possess at least Master in relevant field. At least 5 years of working experience in the related field and industry. Candidate must possess at least Doctorate (PhD) in Nursing or equivalent. Preferably Senior Executive specialized in Education or equivalent. Candidate must possess at least Doctorate (PhD) in Physiotherapy or Medical Imaging. At least 5 Year(s) of working experience in the related field and industry. Candidates must possess at least a recognized Bachelor Degree in the relevant field. For Managers: with 5 years of working experience at capacity as a Senior Executive, in the related field. For Senior Executives: with 3 years of working experience at the capacity as an Executive, in the related fields. For Executive: with minimum 2 years of working experience in the related field. For Accountant: Must be registered with MIA. Jalan SP2, Bandar Saujana Putra, 42610 Jenjarom, Kuala Langat, Selangor, Malaysia.